Kofax TotalAgility™ is a BPM and Dynamic Case Management platform that enables organisations to achieve significant operational gains through better management of processes. More efficient, flexible and better executed business processes mean lower costs plus greater and earlier ROI. Deliver improved visibility of operational performance, to process and task level. TotalAgility’s industry leading support for Dynamic Case Management delivers support for non-standardised, unpredictable processes while improved operational performance visibility is delivered through the availability of user defined dashboards and process analytics. TotalAgility allows users to modify business processes in real time, on live instances of the process, allowing clients to modify their business processes rapidly in response to changing market conditions. In addition, advanced workflow rules can ensure compliance to industry regulations. Kofax TotalAgility can be deployed on premise or in the cloud via Microsoft Windows Azure. TotalAgility delivers industry leading out of the box integration with the Microsoft portfolio, interacting seamlessly with Microsoft Dynamics CRM, SharePoint and Exchange. The software also supports integration with Microsoft Lync for collaboration, as well as non-Microsoft products (such as HP Trim). Integration with on and off premise data repositories allow organisations to easily extract business data and apply it to their business processes. Our information-intensive interactions like filing a claim, applying for a mortgage or patient admissions are still often labour intensive, slow and prone to error. Our Systems of Records which are the backbone systems that run our businesses like the ERP, ECM, BPM and CRM systems, were designed to run our businesses efficiently, but never had the functionality to provide any interactive features between our customers. We need a bridge to connect our mainframe business systems to our customers, so there can be a two-way street. This is achieved through a new genre of software called Smart Process Applications (SPA) that act as systems of engagement. Systems of Engagement is just a term for the ways in which customers interact with an organisation, including face-to-face interactions in branch offices, web portals, mobile apps and social media. 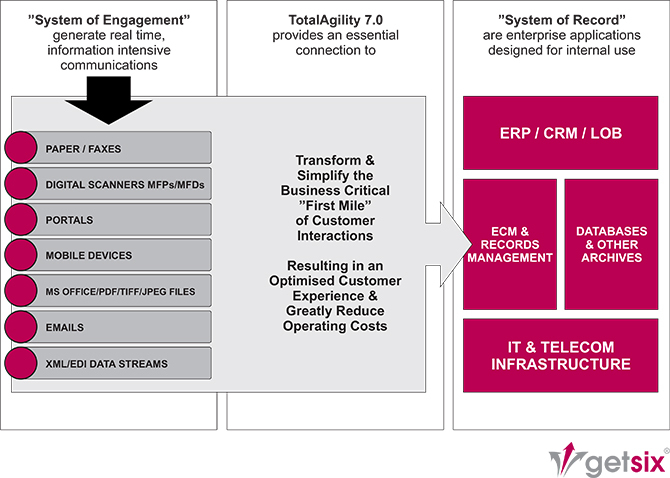 Kofax TotalAgility 7.0 is the world’s first unified smart process application development and deployment platform. It combines mobility, information capture, process management, and analytics to simplify and streamline building SPAs. The beauty of this solution is that you don’t need to modify or change any of your systems of record, you will be able to design the process, develop and deploy applications all on a single platform for lower TCO and faster time to market.